It seems that many of the photos that have ended up on this blog have been taken at Neck Point. It is a compelling place with some very interesting geography. 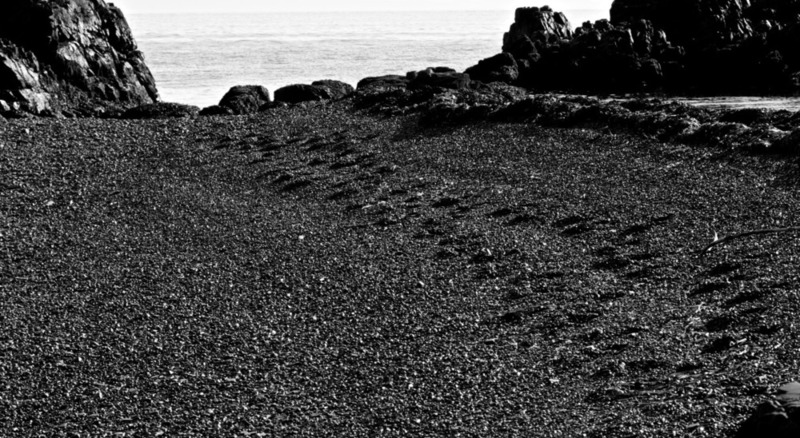 On the beach there is a sloping expanse of small black pebbles that get covered with water at least once a day. On this day as I arrived in the morning someone had been out ahead of me and I was struck by the strongly graphic image that was presented by their foot-steps. I knew this image would be best in black and white and when I processed it in Nik Silver Effects Pro I increased the structure and contrast to bring up to make the rocks really shine.